What are they saying about us? Here are some of the reviews and emails we have received from previous guests and clients. 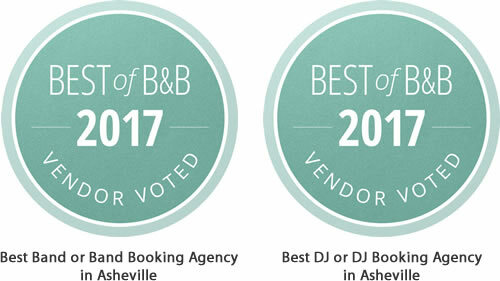 Borrowed & Blue has awarded Sound Extreme Entertainment for Asheville again for 2017! 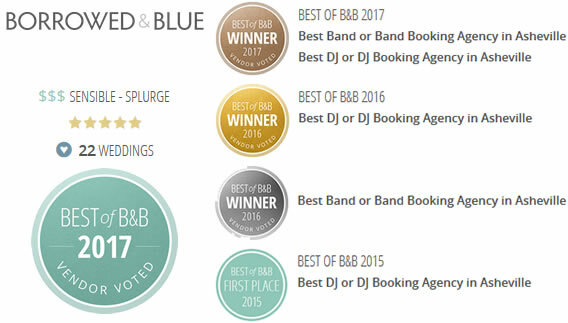 2017 Best Band or Band Booking Agency for Asheville. We won First Place in 2015 & 2014! "I would absolutely recommend Sound Extreme Entertainment for your next special event! Steven was our DJ for our January Wedding. He did an amazing job at ensuring everyone had a great time. Steven was very professional but also was a fun person to be entertained by. He was readily available as well as ensuring the wedding flowed properly. The music he played was right on point. Initially, we were in touch with Becky and Ben. They too, we extremely helpful and quick to respond. Steven went above and beyond despite the unusual layout of our wedding. He was in constant communication with us during the wedding and ensured our ideas were put into action. Thank you so much Sound Extreme Entertainment! Steven was a perfect DJ for us. You all are amazing!" "Paul was our DJ for the reception of our January wedding. He was amazing and played such a great mix of music! He added a special touch by, after hearing that we were big UM fans, playing our collegiate cheer as the last song of the night! Even when there was a technical error with my online submission, Sound Extreme Entertainment went above and beyond to make sure the music I wanted played and the styles I wanted were correct. Paul played a perfect blend of music that kept the very small party on the dance floor all night (which we all know is nearly impossible)! Ben who I was in contact with was great to work with and very professional! I can't say enough how effortless they made this night for me! Thank you to the entire team!" "If you need anyone for an event. Sound Extreme is the place to go!!!! Steven Harris was amazing for my wedding!!! He kept the flow of the ceremony smooth and an amazing reception. From playing the best of today and a few throwbacks in there to getting out and dancing with the entire wedding party. Thank you Steven!!!" "We gave been to 2 parties dj'd by Sandman and then hired him for our New Years Eve party..he is amazing!! Sandy gets the party going and keeps it going...he is so much fun...has so much energy and is so professional...anyone would be lucky to have him host their event! If you are looking for a dj to make your event one to remember...make sure you hire Sandman and sound extreme! Dory & Kevin Young"
"The entire team from Sound Extreme is wonderful to work with! As a wedding planner, I truly appreciate Sound Extreme's ongoing professionalism, punctuality, consistency, and flexibility. They are a great asset to our team when they are working with us. I am personally thankful for them!" "Sound Extreme Entertainment is absolutely phenomenal. I have been working in the music and entertainment industry for years as a musician, lighting designer, and event planner. I have definitely seen the best and the worst... it is safe to say Sound Extreme Entertainment has all of the best DJs, Musicians, Sound Engineers, and System Techs I have seen. "I have had the pleasure of both attending events with Sound Extreme Entertainers as well as organizing entertainment for events and hiring them. "I have been the Entertainment & Fundraising Chair for a local Asheville convention the past two years and have used Sound Extreme for both years I served on the committee. Their prices are fair and quality of their services are like no other entertainment company in Western North Carolina, they are the BEST. "I struggled to find an entertainment company for our convention. We have over 1,100 people attend every year and finding a DJ as well as a sound system that are both sufficient for such a large amount of people is difficult. "I called Sound Extreme and it was no problem for them. They provide our sound system in the expo center of the Crowne Plaza for our main speaker on Saturday night of the convention as well as DJs, sound, and lighting for the two dances we do throughout the convention. The sound in the expo center was amazing, and the DJs kept the crowd going from the time the dance started at 10pm until 2am. "Being a DJ myself, I know it is difficult to DJ for a crowd of such mixed generations and walks of life from all over the country. EVERYONE was up and dancing all night with such great music selection by the DJ. This shows me they are the perfect DJs for any event whether it be a wedding, corporate event, prom club...ANYTHING. "I can go on an on about Sound Extreme. To sum it up, if you are having an event and need an entertainment company that will be on time, provide amazing services day of as well as amazing customer service and communication while planning your event ... Sound Extreme Entertainment is the only answer." "Sandy (DJ Sandman) is best DJ ever! He knows how to make people get up and DANCE!!! People are STILL talking about how good the wedding DJ was!" "We couldn't have picked a better DJ! We will be forever thankful for everything Sound Extreme and Steven did for us on our wedding day. Our officiant did a no call, no show on our wedding day. Steven saved our wedding by finding another officiant to marry us, he even offered to do the ceremony for us. Steven, you are a hero and we can never thank you enough!" "we used sound extreme entertainment for our wedding in Glenville, NC, they came highly recommended from our coordinator and planner, I am so happy we booked them. Stephen our DJ was just perfect. We had a mix of hispanic and american in our guest list so we wanted to make sure we could play music for everyone. He totally understood and even recommended some tunes. It truly was an easy process, we spoke a few times before the wedding to make sure everything was set. Stephen was very nice and helpful throughout the whole process. It was perfect. Thank you Sound Extreme for sending us Stephen to DJ at our wedding. We had a wonderful time." 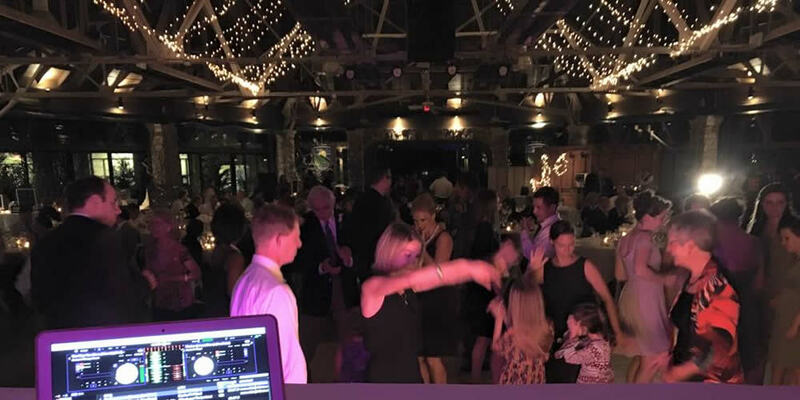 "We booked Sound Extreme for our wedding reception and DJ Carl did a great job! We sent him a playlist prior to the wedding of songs we wanted played; he strayed a bit from the list, but he got everyone out on the dance floor which is what we cared most about. He also did a great job with the introductions and announcements. I would definitely recommend Sound Extreme!" "I used Sound Extreme (Ken was my DJ) for my wedding and it was perfect! We chatted a few times before the big day and I was able to give him a list of my must plays and do not plays. He was great at giving suggestions and helping me plan the flow of my evening. My guests all said the reception was so much fun and that the dj played great music. We personally went for a more upbeat reception with few slow songs and it went over wonderful! I couldn't have asked for a better dj for our wedding :)"
"Our DJ, Justin, from Sound Extreme did a great job of taking our requests and putting together the perfect playlist for the reception. He worked closely with my wedding director to get cues for when to announce different events in the reception (i.e. cutting the cake, father-daughter dance, etc.). The only negative was that he did not work very independently. However, the music selection was perfect and reflected us as a couple well. Justin was professional, accommodating, and kept the party going so we didn't have to. I would absolutely recommend Sound Extreme for a friend's event." "We were extremely pleased with our decision to hire Sound Extreme Entertainment. They were so easy to work with and we had such a great time dancing the night away at our wedding! They played all of the fun songs that we requested and kept the dance party going until the very end." "I highly recommend Sound Extreme Entertainment! Because we live in Raleigh and our wedding was in Asheville, we did all of our communication over the phone. Our DJ gave us everything we wanted and did a great job at keeping the guests happy and on the dance floor. We were very happy with them!" "Our DJ couldn't have been more responsive to the list of songs we provided him to play at our reception. He took our creative entrance in stride and had fun with the entire wedding party. Throughout the reception, he always asked my husband and I what songs we wanted to hear and took our requests right away. " "Paul of Sound Extreme did a fantastic job as a DJ for our wedding. We got to speak with Paul beforehand to go over the special requirements we had for our grand entrance as well as the different styles of music we liked. Paul executed our Grand Entrance perfectly and kept our guests moving all night long. He really did a fantastic job and I would highly recommend him and Sound Extreme to brides." Justin was our DJ and he was awesome. I had a specific list with some songs that were not readily available so he was able to get them from my computer remotely. He also had a great vibe of the crowd and played the right songs at the right time. He also had a list of my must plays and made that happen as well. I will definitely use Justin and/or Sound Extreme again! Steven Harris did an amazing job with our event. We l at him have free reign over the music and only gave him a "do not play list". When there were requests he would consult with the groom and I to be sure it was okay. Everyone danced all night and it was fabulous! Truely a night I will never forget. Thanks Steven and Sound extreme!!! Sound Extreme Entertainment is our preferred music provider. We have worked together for several years with the Crocodile Smile Band and with several of their DJs and Emcees. They have always provided the right personality for the function and have always conducted themselves in a professional manor. I'm not sure who this email goes to specifically but I wanted to send one to Ben and the Business Sound Extreme. My husband, Josh Cash and I got married... in Brevard and Carl with Sound Extreme was our DJ. I have to say that that day was THE best day of my life so I wanted to email and thank you for your service. The wedding was beautiful and Carl did a great job to fill in the blanks where I had no game plan (thanks Carl!) Afterward, he did a wonderful job keeping the party going. Everyone had such a great time that we extended the party!! So I'm very thankful for your company and was very pleased with Carl as our DJ and wanted to say thanks so much! Josh and I will definitely be passing your information along to others for future events! I would like to take this opportunity to thank you and tell you how wonderful your band was at our 20 year high school reunion for East Henderson High Alumni. From start to finish, your band was very professional and courteous to all attendees. Your library of music was perfect for the setting and the quality of sound was excellent. The price you quoted fit right into our budget, which is always appreciated! Everyone enjoyed listening and dancing to your great performance and appreciated the audience participation. People are still talking about "How great the band was!". We appreciated the great performance that you gave us and will definitely be spreading the word about you, to anyone that is looking for a great band! If the occasion comes up again, we hope to use you at another event! Thank you for your hard work and good luck in the future! I booked Sound Extreme for our Vampire Ball here at Camp Pisgah last night, June 28th. Our DJ, Steven Harris, did a wonderful job. He came dressed in a costume to fit the event theme. He played child appropriate music and he even danced with us! We have used Sound Extreme for the last three years and have always been satisfied but Steven has been by far the best DJ we have had. We were very impressed and really pleased! We just want to thank Ken and Moto for doing such a great job with our wedding. Ken was really helpful with music selection and his introductions and music timing were great. The late night rocked it with Moto. We see a lot of shows here in town and all over, but we were impressed with his music selection and skills. They both helped to make our wedding memorable and an all out blast. I just wanted to thank you soooo much the deejay came so early to set up which really surprised me, he was dressed nice and he was very professional and friendly. He was so easy to talk to and we really enjoyed having him spend our special day with us. I hope he had fun . He kept the little girls entertained lol. Once again thanks a million ya'll helped make our day the best day we could ever have asked for!!!! I just wanted to let you know that Chase was phenomenal on Saturday night. Everyone has been buzzing around the office talking about the great music! Glad I didn’t use an ipod! Hope you guys have a great Christmas and New Year!!! Wanted to let you know that the DJ was FANTASTIC!!! I would have paid twice as much for that! He was great, thanks so much! I wanted to let you know how much we enjoyed having Joey as our DJ on Friday. He had all the right music and the employees enjoyed the day.... we added in $100.00 extra for Joey. You guys are AWESOME! I couldn't have asked for better!!! We totally appreciate everything! Justin was more than a DJ. He helped with everything, even sneaking me away for a minute when I needed a break! I cannot say thank you enough! Thank you so much for a wonderful selection of music at our wedding... We had so much fun and everyone can't stop talking about it. I wanted to first say you guys did a great job.... I was very impressed with Justin and Ty. Thanks again! Like I said earlier, I can't tell you how great it has been to work with y'all! Thanks so much! We had the BEST birthday party for Sandy Wilson of Micah's in Cashiers. KEN is the best leader, DJ, ever. The entire group at my house fell in love with him, appreciated his talents and professionalism. Many are saying it was their favorite party ever.... large part due to Ken's talent. Thank you so much. Thanks for working so hard to get my DJ. My party was amazing! Your guys were GREAT at the Hendersonville Prom again this year!!! We would love you to do our Prom next year as well... at the Hendersonville Country Club. I just wanted to say thank you! Our party was great and our dj was awesome! He was great with the kids and the lights and haze machine were perfect. Thank you again, it was great working with Sound Extreme. I will definitely call you again for another party and refer you to all of my friends! Thank Joey for us also! Ben, wanted to say how much we appreciated the DJ's work at our daughter's wedding at Deer Creek Run. He was the perfect choice. Thanks again for helping to make the reception fantastic. Just wanted to drop a note to let you know how pleased we were with our DJ at Lauren and Will J_____'s wedding last Saturday. Everything was perfect and everyone had an awesome time. Thank you so much! Your DJ did a great job at Katie and Mike's wedding. We had so much fun! When no one was dancing he got on the floor and got it started. He really made the difference. Great music selection and he had all the requests. Great Job! We just wanted to take a moment to thank you for a wonderful wedding! We are still talking about how much fun we had! Your professionalism and attention to detail made all the difference. When we woke up to all the snow, we really thought it would be a mess, but Justin was all set up and the music was playing when we got to the hall. He really helped make the reception a success. Thank you again! 6 months after our daughter's wedding and our guests STILL talk about how GREAT Crocodile Smile was. You guys were AWESOME! Enjoy the pics! Ben and crew....can't thank you enough! !